Everyone on the Waverider knows that you don’t mess with Sara Lance, so they’re all rightfully terrified when they find out that Sara has been possessed by Mallus and taken control of the death totem. With her chalky skin, black eyes, and flat silver hair, Sara is a heartless killing machine that will stop at nothing to stop her allies and unleash her demonic master, but her teammates aren’t going to lose their leader that easily. “Necromancing The Stone” is a more serious episode of DC’s Legends Of Tomorrow, and Mallus taps into each hero’s deepest fears and regrets to engage in psychological warfare that eventually turns into physical violence. Wally sees his ex-girlfriend, Zari sees her dead brother, and Nate sees his grandfather, but these are just visions to throw each Legend off while Sara waits to attack. “Necromancing The Stone” pulls from the claustrophobic horror of Alien as the team deals with a possessed Sara Lance, and she activates the Waverider’s Nostromo sequence (the name of the spaceship in Alien) to trap her teammates. They have nowhere to run, and they make the mistake of splitting up, giving Sara the opportunity to pick them off one by one. The visuals are dark and handheld cameras are used to create an atmosphere of instability and urgency as the Legends enter panic mode. Sara maintains all of her physical prowess when possessed, but she also gains demonic abilities that allow her to shapeshift, teleport, and move things with her mind because she wasn’t scary enough already. Sara Lance is the heart and soul of this series, so it raises the stakes considerably when she’s compromised by the season’s big bad. 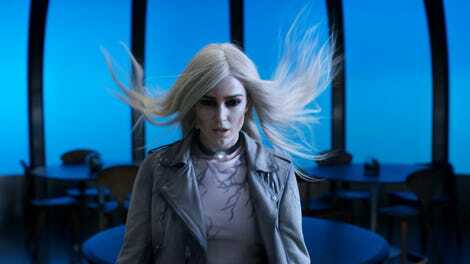 This episode gives Caity Lotz the opportunity to be a stone-cold badass for most of the hour, and her intensity as a Mallus-possessed Sara contrasts with the vulnerability of Sara in Mallus’ dimension. Sara is confronted by images of her past working as an assassin for Ra’s Al Ghul, and Nora Darhk gives her the opportunity to let go of her guilt by joining the dark side. This internal conflict has been with Sara for this entire series, and while her resurrection allowed her to pave a new heroic path for herself, she still lives with the emotional trauma of being a killer. You can see hints of remorse in Lotz’s performance as past Sara, and even though she tries to look tough when the daughter of her latest victim discovers her dead father’s body, it’s clear that this moment shakes Sara to her core. That young girl haunts Sara in her nightmares, and when the present-day Sara looks at this past moment, that remorse is significantly amplified. But she’s not going to let go of that pain. She recognizes that the sins of her past make her who she is today, and they give her strength by motivating her to fight for the forces of good. She’s been an agent of death in the past, and she’s still damn good at killing people if she has to, but she refuses to let that define her and this resilience is what ultimately breaks Mallus’ hold on her. The totems are starting to get assigned to different members of the team, and while Nate isn’t able to tap into the earth totem before Sara gets to him, Mick fulfills his ultimate destiny when he bonds with the fire totem. This life-long pyromaniac gains the ability to magically create and manipulate fire, and while he’s initially reluctant to be a totem-bearer, once he gets a taste of the power, he knows he’s made the right decision. Mick with pyrokinetic abilities is pretty damn awesome, and it would be really cool to see him hold on to these abilities after this Mallus storyline is over. A gun that shoots fire is nice, but being able to summon flames with just a thought makes Mick much more formidable. Even though this episode has a more severe tone, it still maintains that signature Legends sense of humor thanks to John Constantine, who returns this week when Ava and Gary seek out his services to save Sara’s life. His old plan was to just kill Sara when Mallus took over her body, but with Ava and Gary’s help, he’s able to find a way to weaken Mallus to the point where Sara can fight back and reclaim her body. There’s a lot of fun banter between Ava, Gary, and Constantine, and the script takes advantage of Ava and Constantine’s mutual affection for Sara to create tension and laughs. It was announced today that Matt Ryan will be a regular cast member of Legends Of Tomorrow if it is picked up for a fourth season, and it’s a very smart decision given the strength of his guest appearances. Ryan’s Constantine exudes a smarmy sexuality that makes him stand out in this ensemble, and his magic-based abilities round out the team’s power set and give them an expert for mystical threats. I love seeing how Ryan’s Constantine has had a second life in the Arrowverse, and I’m very happy The CW took notice of how well cast he was on NBC’s short-lived Constantine series and has given him the chance to continue exploring this character in an even more fantastic superhero context. I really enjoy Gary and hope the series continues to use him every so often in the future. I don’t necessarily want him to be a regular because his schtick could easily become grating over time, but he works very well as a sporadic presence that adds some laughs to the episode. Anyone else shipping Gary and Constantine after this episode? I hope that Dungeons And Dragons session ends with more kissing for those two. I am all about the Beebo callbacks. The most awful thing Mallus does to Sara is give her that hair. He’s truly a monster.